The event on Wednesday afternoon filled the school auditorium with elected representatives, area residents, students and teachers. Rep. Peter Welch was the first to welcome the newest citizens. “We say thank you, we say we welcome you and we say you are going to make our strong country stronger,” he said. Judge Colleen Brown, who administered the oath, described the gravity of the day’s occasion. “It is by welcoming and integratig people from around the world, the United States has become the country it is today,” she said. Rosalind Gramling first came to the United States from the United Kingdom when she was 5 years old. At 55, the physical therapist from South Burlington said the current political climate made her want to take on a greater responsibility. Indra Khatiwoda of Essex lived in Bhutan and then Nepal before arriving in Vermont. The 37-year-old has found work at Global Foundries and also works in school transportation. Standing outside with his family following the ceremony, Khatiwoda said there was no where else he’d rather be. The following the administration of the Oath of Allegiance, Neshobe fifth- and sixth-grade students sang songs and recited the preamble to the Constitution of the United States. He sang the first two verses, then looked up at the crowd before him and smiled. “Why don’t you sing it with me?” he said. Then the new citizens all sang together. 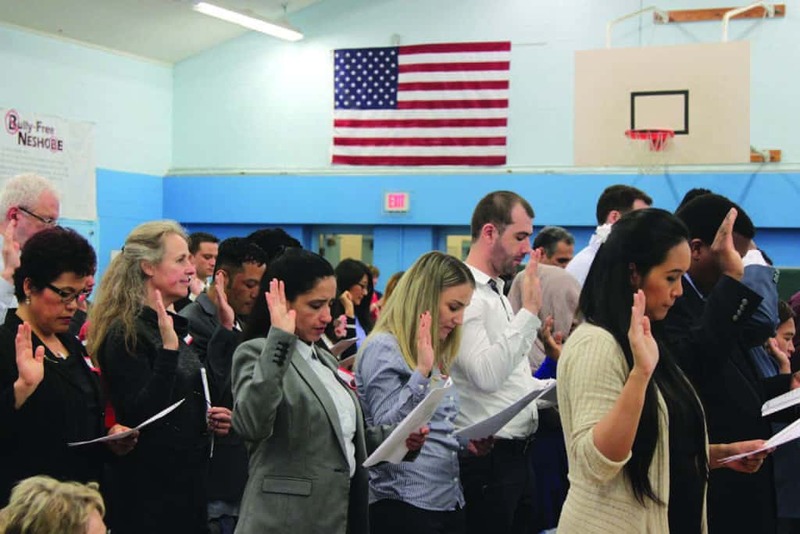 A group of 62 candidates from 29 countries recite the Oath of Allegiance during a naturalizaton ceremony at the Neshobe School in Brandon, Wednesday, May 10.